Quite a sight. Butterfly Mariposa Lily on Mt. Hamilton. It’s not often these days I can stop to take a photo on Mt. Hamilton and see something new. I’ve seen it all before, until I came across the Butterfly Mariposa Lily growing on the side of the road past Smith Creek. It made the ride worth the effort. I’ve never seen this flower on Mt. Hamilton, or anywhere else for that matter, but it is listed in a compendium of wildflowers on Mt. Hamilton, so I guess it’s not all that rare. 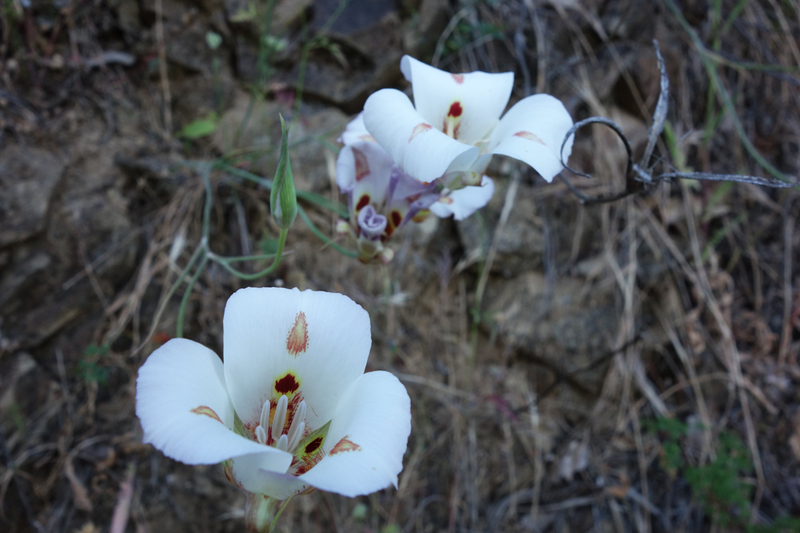 I took some pics of Calochortus venustus and continued on up the mountain in ideal weather. At the summit I noticed strong, cool winds and wondered what the backside had to offer. It wasn’t nearly as windy once I crossed Isabel Creek and it was mostly a tailwind anyway. On the next descent I saw more signs of the winter’s heavy rain as I passed a stop sign and barricades where the road is caving in. While the weather service promised lower temperatures, in the mid 70s, it was a bit warmer, maybe as much as 80 degrees at the Junction store where I shelled out $5.50 for a bottle of Gatorade® and a Payday®. Refreshed, I headed out onto Mines Road, past Ruthy’s place and began the long climb that never fails to give my legs a test. I descended and then continued up the last hill, the Double S. From there, at 2800 feet altitude, it’s all downhill to Livermore, mostly. It’s also where headwinds can be expected, but just how severe is always the question. Today it wasn’t so bad and it was a welcome cool air. I crossed two dribbling creeks over the road that I figured might be dry by now, but it was a wet spring. The ride down the canyon gives you a chance to rest up and enjoy the view, which can be breathtaking with wildflowers in bloom, but I missed out on those due to work on Mt. Hamilton Road that didn’t end until late May. Fortunately, Mines Road survived the harsh winter, with only one stop sign and road problem, while the 1982-83 slide repairs have held up without any issues. In Livermore I decided to take Stanley Boulevard as opposed to the shorter but unfriendly Hwy 84 over Pigeon Pass. In Pleasanton the one-degree drop in temperature could be noticed, but it was still hot enough to bring out the ice cream crowd as they lined up to be served at the drive-through Meadowlark Dairy. I wasn’t after ice cream, just Gatorade, so there was no need to stand in that line. I chose Foothill Road over the usual Pleasanton Sunol Road since I was headed down Niles Canyon, Hwy 84. It’s a pleasant, quiet ride on Foothill in the shade of trees and not much traffic, but I suspect that’s not true on a weekday. I bet it’s jammed with commute traffic. Once on Hwy 84 I was reminded why I stay off this road unless there is no other choice, and that was the situation today since Calaveras Road, my usual route, is closed for God only knows how long. It’s just as well since the Waze crowd turned it into a commuter’s race course. I made my way home via Stevenson Boulevard/Boyce/Cushing Fremont, about as good a route as you can hope for in this area. After some research I found out that there is a plan to build a recreation path through Niles Canyon. That’s even better than my thought of widening the road. You can find out more on a Bike East Bay website. Be sure to contact Alameda County’s Chris Miley by email and let him know you support such a plan. Niles Canyon has a lot of beauty, but it can’t be enjoyed on Hwy 84, by car or bike, as anyone who has driven there can attest. If they need money, they should look to the state of California, which, if it knows what’s good for it, will abandon that stretch of Hwy 1 at Big Sur that sees rock slides every five minutes. Imagine where all that money could be put to better use…in Niles Canyon. This entry was posted on June 5, 2017 at 10:32 am and is filed under Ride reports. You can follow any responses to this entry through the RSS 2.0 feed. You can leave a response, or trackback from your own site.